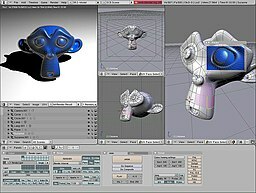 Texture mapping is a method for adding detail, surface texture, or colour to a computer-generated graphic or 3D model. Its application to 3D graphics was pioneered by Dr Edwin Catmull in 1974. A texture map is applied (mapped) to the surface of a shape, or polygon. This process is akin to applying patterned paper to a plain white box. Multitexturing is the use of more than one texture at a time on a polygon. 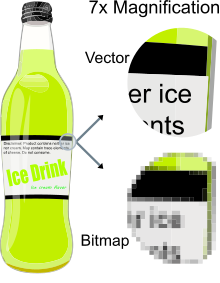 Procedural textures (created from adjusting parameters of an underlying algorithm that produces an output texture), and bitmap textures (created in an image editing application or imported from a digital camera) are, generally speaking, common methods of implementing texture definition on 3D models in computer graphics software, while intended placement of textures onto a model's surface often requires a technique known as UV mapping (arbitrary, manual layout of texture coordinates) for polygon surfaces, while non-uniform rational B-spline (NURB) surfaces have their own intrinsic parameterization used as texture coordinates. Texture mapping as a discipline also encompasses techniques for creating normal maps and bump maps that correspond to a texture to simulate height and specular maps to help simulate shine and light reflections, as well as environment mapping to simulate mirror-like reflectivity, also called gloss. Rendering resolution-independent entities (such as 3D models) for viewing on a raster (pixel-based) device such as a liquid-crystal display or CRT television inevitably causes aliasing artifacts mostly along geometric edges and the boundaries of texture details; these artifacts are informally called " jaggies". Anti-aliasing methods rectify such problems, resulting in imagery more pleasing to the viewer, but can be somewhat computationally expensive. Various anti-aliasing algorithms (such as supersampling) are able to be employed, then customized for the most efficient rendering performance versus quality of the resultant imagery; a graphics artist should consider this trade-off if anti-aliasing methods are to be used. A pre-anti-aliased bitmap texture being displayed on a screen (or screen location) at a resolution different than the resolution of the texture itself (such as a textured model in the distance from the virtual camera) will exhibit aliasing artifacts, while any procedurally defined texture will always show aliasing artifacts as they are resolution-independent; techniques such as mipmapping and texture filtering help to solve texture-related aliasing problems. 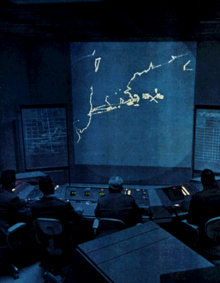 Charles Csuri is a pioneer in computer animation and digital fine art and created the first computer art in 1964. Csuri was recognized by Smithsonian as the father of digital art and computer animation, and as a pioneer of computer animation by the Museum of Modern Art (MoMA) and Association for Computing Machinery- SIGGRAPH. This page is based on the Wikipedia article Computer graphics; it is used under the Creative Commons Attribution-ShareAlike 3.0 Unported License (CC-BY-SA). You may redistribute it, verbatim or modified, providing that you comply with the terms of the CC-BY-SA.